A drilling industry support company requested hydraulic solutions provider, Custom Fluidpower for assistance with development of drilling mud cleaning rigs. The purpose of the rigs is to remove the need for the open pit next to the drill rigs which holds drilling mud. These mud cleaning rigs would save time and money and reduce environmental costs. The rigs would be mobile and fit on the back of a truck. They would be able to jack themselves up off the truck and stay onsite until the completion of drilling. Another function of the proposed rigs would be to remove large particles from the drilling mud with baffle plated tanks where the dirt can settle and the use of a screw classifier to remove the particles. Having contracted an external engineer to design the unit, the customer requested Custom Fluidpower’s assistance with the hydraulic system. 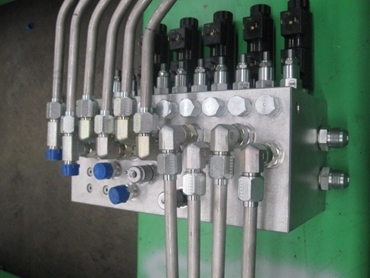 Custom Fluidpower designed two manifolds with Sun Hydraulics valves for the jacking and control of the rigs and suggested that Parker pumps be incorporated to fill the flow and pressure requirements. In addition, Hydac filtration was incorporated to ensure that the oil stays at a satisfactory cleanliness level to maximise product and system life. Custom Fluidpower undertook the complete installation and commissioning and worked closely with the engineering consultant on these units. As a result, nine rigs were successfully completed.